When you consistently find ants in your house it’s time to do something about it. There are a few methods you can use to both get rid of the problem and prevent future infestations. We’ll discuss the best approach, but also some natural ways to stop ants in your house. But first, you should know how these pests end up inside your dwelling in the first place. It may seem like common sense or knowledge you picked up in grade school but ants live outside your home. They live in large numbers under the ground in groups called colonies. An ant colony is headed by a queen ant who stays in the ant’s home while her “children”, the worker ants called scouts, venture out to find food and bring it back to the colony. Since your home has lots of food for you, it obviously has an abundance of food for these little pests. Even your pet’s food is a lure for all critters from big ones and small. Unfortunately, ants wind up inside your home looking for food, eventually find something, then haul it back out to their home. Along the way, they leave scents for their kin to follow them inside once they’ve found a good food source. Now, with the basics under your belt it’s time to learn how to remove them and keep them from coming back for good. Most of the time, taking care of the ants in your house means stopping them at their source. Too many times, people try to solve their problem by killing the ants they see inside with fast acting poisons and/or traps. This does nothing to keep others from coming back. You need to get rid of the colony. The challenge is that the ant “farm” so to speak is outside, and you may not know where it is To make matters worse, there may be more than one. The best method then is to give your unwanted visitors a snack that kills them but not right away. You want them to stay alive long enough to make it back home and “distribute” your new offering to the rest of the colony. The way you do this is with ant bait. The right product will be in a form that attacks them more than anything else in your house and has a slow-kill effect. Over the years, there have been many products on the market. 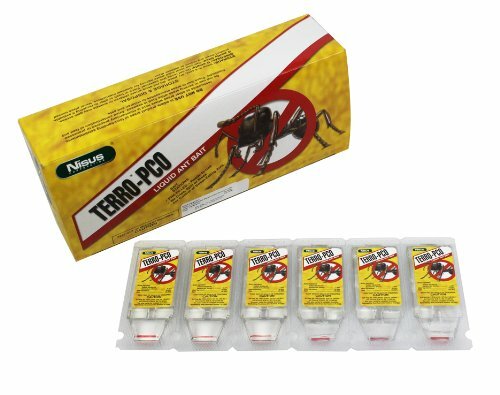 A tried and true one is called Terro-PCO Liquid Ant Bait. You usually buy this stuff in packs of small “stations”. They are in a liquid form containing a substance that is appetizing to many types of ants. Its potent ingredient is essentially Borax, a common boron compound used to kill ants. In this form though, it is the perfect application since it is self-contained and gets the ants to “take” it back to the colony… without you having to. Place one or more stations inside where ant penetration is the most visible. Do not use any other poisons or anti-ant ingredients at the same time. What you might see at first are ant trails actually increasing in size since ants will love this stuff. Within a day or two, the lines will begin to thin out. Depending on how many ants you see at this time, you can replace a used bait station to ensure you don’t run out to complete the cycle for the whole nest. Have patience, and realize this method is a more permanent approach compared to the illusion that you’ve destroyed the ants just because you killed the ones you saw inside immediately. Using this system to get rid of ants is truly the most effective. Traditional traps and kill powders can be used if you really just have a few getting inside or it’s obvious there is only a small nest to blame. Traps and powders usually aim to kill on contact. While this makes you happy because the guys you see are instantly gone, it isn’t a long-term solution. Some homeowners have had success sprinkling kill powders and sprays outside (a foot from the house and a foot up the house) to help prevent your little friends from coming inside. The kitchen is the worst place for an indoor ant infestation because it has so much to offer ants. It’s also a place where you may be more leery about using harsh chemicals or poisons to get rid of the ants. The bait stations described above are great in this part of the house, but let’s talk about ways to control them here in the first place. The best thing you can do is keep your kitchen clean and free of dirt and left-over food particles. Picking up crumbs seems obvious, but you may need to go a step further. One tip is wash down your counter tops and floors consistently. You can use a water and vinegar mixture or disinfecting wipes to help wash away any “hey guys, this way!” scents that may be left by a scout ant who’s on the prowl. Keep all foods and cooking ingredients that are sweet or greasy tightly covered and sealed up. Also, check for small openings and cracks where windows, vents or plumbing is on the walls around your kitchen. You’ll want to seal these up with caulking or spray foam. If none of the above methods seems to work for whatever reason, you can certainly call a professional pest control company or exterminator. Ants in a house is a common problem, and you can work with someone who’s used to dealing with ants until the problem is gone.